So Friday, when we went to get something out of the chest freezer, we noticed that the loaf of bread was thawed. After careful inspection, I found that Baby Bunnie had chewed through the power cord to the freezer. I started putting as much as I could into our other freezer. While doing that, I decided to pull out a package of meat. Eenie-meenie-miney-moe. I ended up pulling a 2lb package of pork tenderloin out to thaw. Looking up recipes, I found this one for a pork roast. I know tenderloin & roast isn’t the same, but it was simple, I had the ingredients, so I went with it. I changed it up a bit. It didn’t take as long to cook as the roast would have. It turned out wonderful! 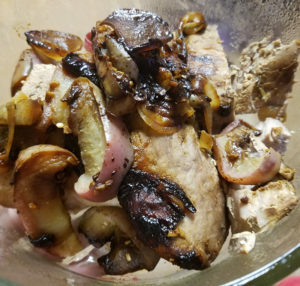 The caramelized onion with soft apples and seared pork. Mmmm-mmm! I cooked it in my Ninja 3-in-1, so I only had one pan to clean. 😉 Smart. I LOVE my Ninja. I have the older 3-in-1 model. I’ve been contemplating getting the newer one. It does so much more! I also had made waffles for breakfast, and tuna melts for dinner. Three meals in one day? Go me! The original recipe is from the Taste of Home website. I love Taste of Home. I’ve subscribed to their cooking magazines off & on for over 25 years! (Wow, that makes me feel old.) You can get a year’s subscription for only $8 through Amazon right now! 3 large Golden Delicious apples, cut into 1-inch wedges I had red delicious, they worked great! 2 large onions, cut into 3/4-inch wedges I only had one. 5 garlic cloves, peeled I used minced garlic from Sam’s Club I love the stuff & use it in everything that calls for garlic. These directions are my directions, and are not from Taste of Home. Preheat Ninja to high heat for sauteing. Sprinkle roast/tenderloin with salt and pepper. Place roast/tenderloin in Ninja; brown on all sides. Switch Ninja to oven at 350 degrees. Place apples, onions and garlic around tenderloin; sprinkle with rosemary. 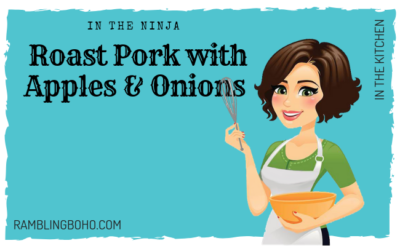 Cook until a thermometer inserted in pork reads 145°, about 35-50 minutes (depending on thickness), stirring once. The original recipe is from Taste of Home. It's changed to use a tenderloin instead of a roast, and using a Ninja 3-in-1, instead of the oven.